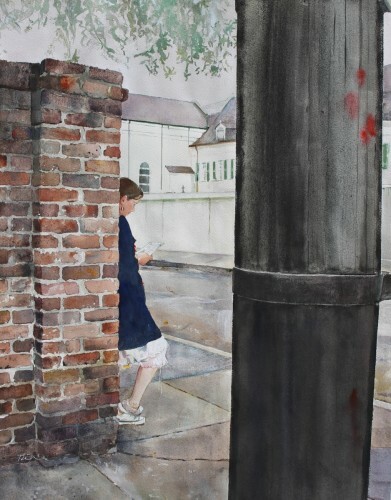 Original unframed watercolor, capturing a moment glimpsed while rounding the corner near New Orleans' historic Old Ursuline Convent. 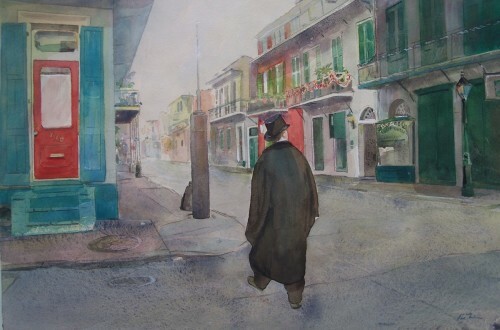 Original unframed watercolor, solitary figure's Sunday stroll down Bourbon Street, historic Vieux Carre. Original unframed watercolor, parochial students stepping across Bourbon Street to school. 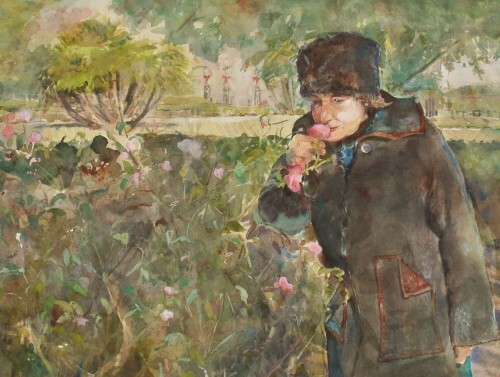 Remembering "La Vie en Rose"
This original unframed watercolor was inspired by a woman in Jackson Square, New Orleans. She, like the rose’s bloom, is beginning the winter of her life. Stopping to smell a flower, through the park drifted the melody of a street musician’s tune “La Vie en Rose”. In my artistic interpretation, memories call her to recollect sweet times past when Louie Armstrong performed the same song just blocks from this site. 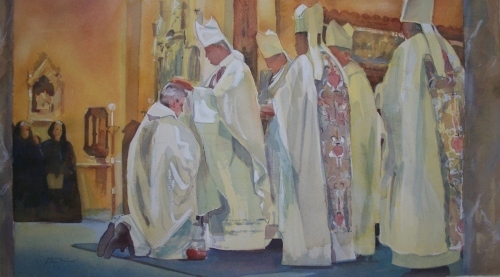 Original unframed watercolor, celebrating a Southern Bishop's ordination day. 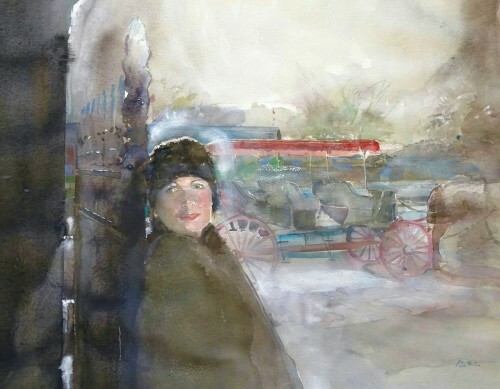 Original unframed watercolor, glimpsed moment in time at Jackson Square & Decatur Street, New Orleans. 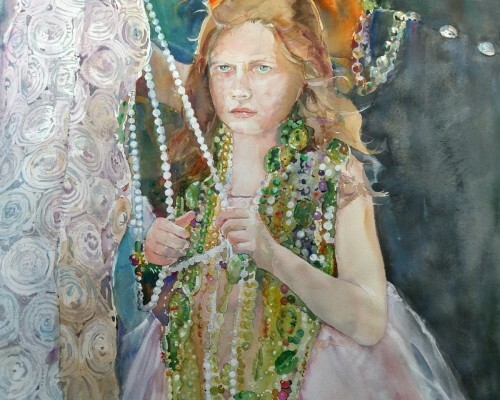 Original unframed watercolor, young girl glimpsed with parents selling Mardi Gras beads. 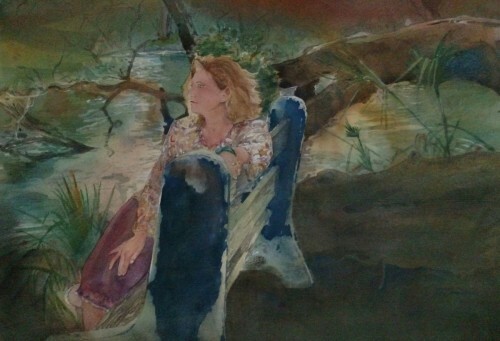 Original unframed watercolor, quiet time at City Park, New Orleans, LA. 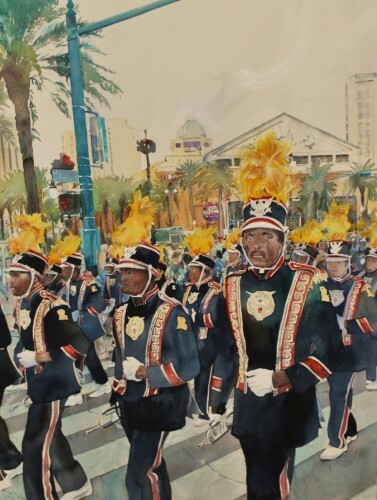 Original unframed watercolor, the pageantry of Grambling State University's traditional march in New Orleans' Christmas Day Parade. 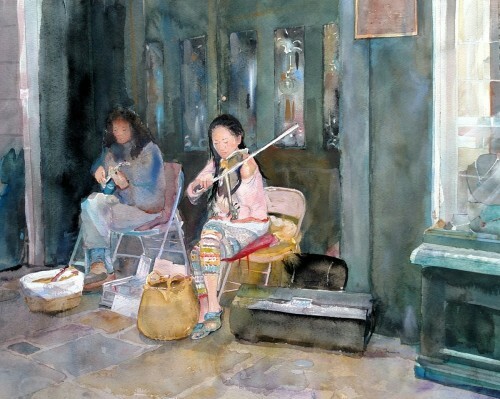 Original unframed watercolor, New Orleans musicians Tanya & Dorise entertaining on Royal Street. 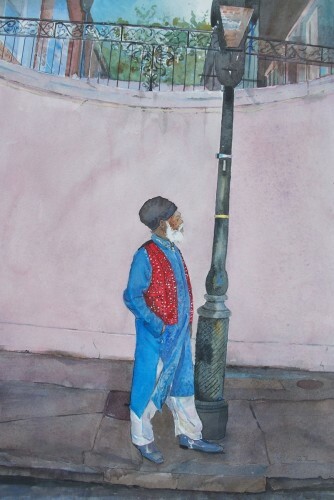 Original unframed watercolor, observer near New Orleans Historic Voodoo Museum. 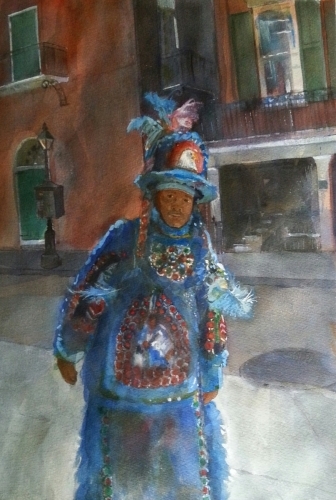 Original unframed watercolor, a costumed Mardi Gras Indian glimpsed rounding the corner in New Orleans French Quarter.